Building Evaluation Capacity. David and I have teamed up to apply empowerment evaluation concepts and principles to build evaluation capacity at Google and beyond. We are using rubrics to focus learning, and student ratings to identify areas that are strong or merit attention. 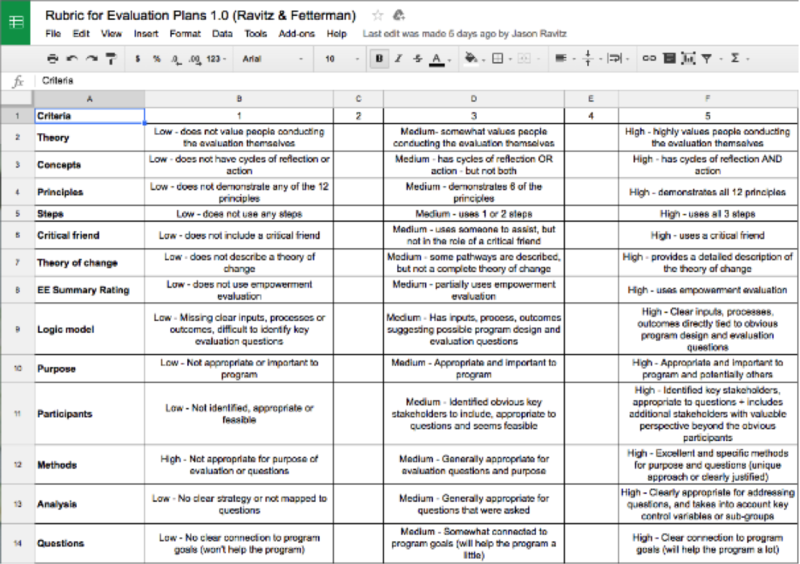 We are using a 3-step approach to empowerment evaluation and an evaluation planning worksheet (building on my graduate school courses with Nick Smith) to help our colleagues assess their program’s performance. With little or no evaluation background needed, teams dive into the worksheet to focus on their program’s purpose and goals before setting up metrics. Laying out the evaluation plan is often illuminating — leading to refined program logic, alternative (and more meaningful) programmatic plans, and more useful ideas about how to measure processes and outcomes. Beyond Google. We are also sharing our work with nonprofits and higher education. 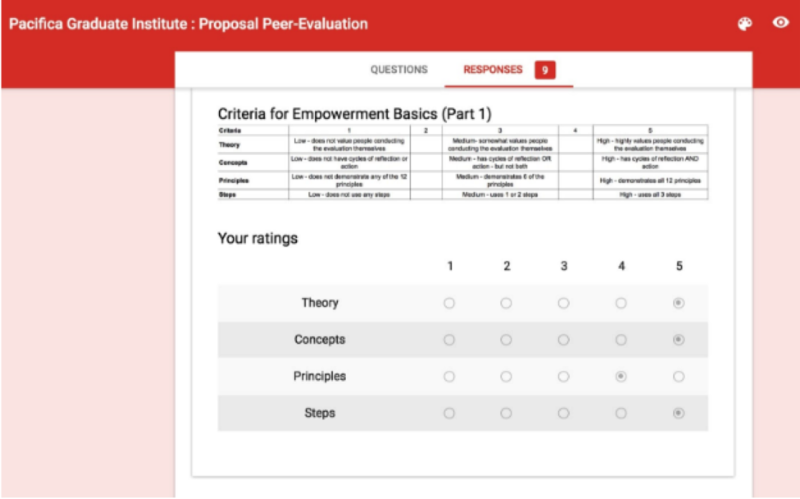 Through the Computer Science Outreach Program Evaluation Network (CS OPEN) Google is supporting evaluation for 12 nonprofits through a partnership with the National Girls Collaborative Project. What is the overall program purpose? Who are the audiences for the evaluation? How will the result be utilized and by whom? Rubrics and Technology for Peer Review and Self-assessment. Students in our course are developing evaluation proposals that can help them conduct evaluations, solicit funding, and/or guide their doctoral dissertations. The class meets face-to-face, but includes a virtual classroom strategy that has worked well in the past. Students use rubrics to guide their self- and peer-feedback to refine and improve their work and understanding. This improves the proposals, guides instruction, and models our focus on empowerment and capacity building. Computer screen snapshot of proposal posted online (using Doctopus) with our rubrics (in Goobrics) above to rate or evaluate the proposal. This is a partial version of the rubrics used in the empowerment evaluation at Pacifica Graduate Institute. 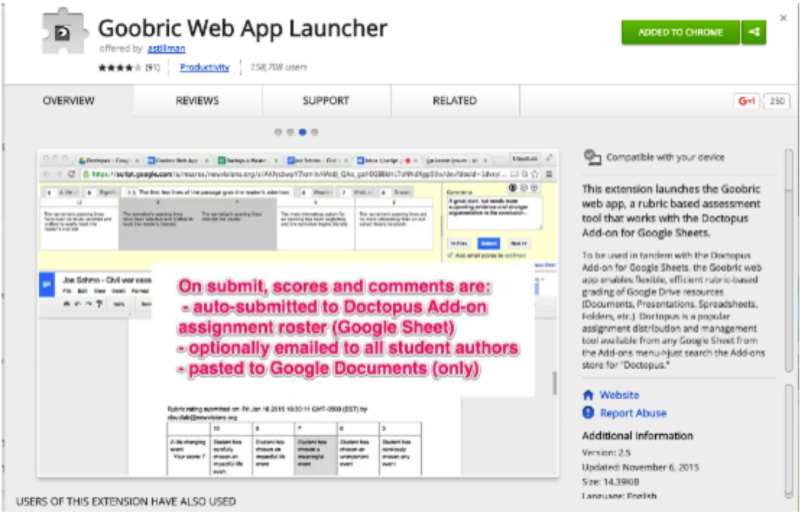 Doctopus: A tool for teachers to manage, organize, and assess student projects in Google Drive. Goobrics: This rubrics based assessment tool works with Doctopus, allowing teachers to evaluate student’s work in Google Drive. 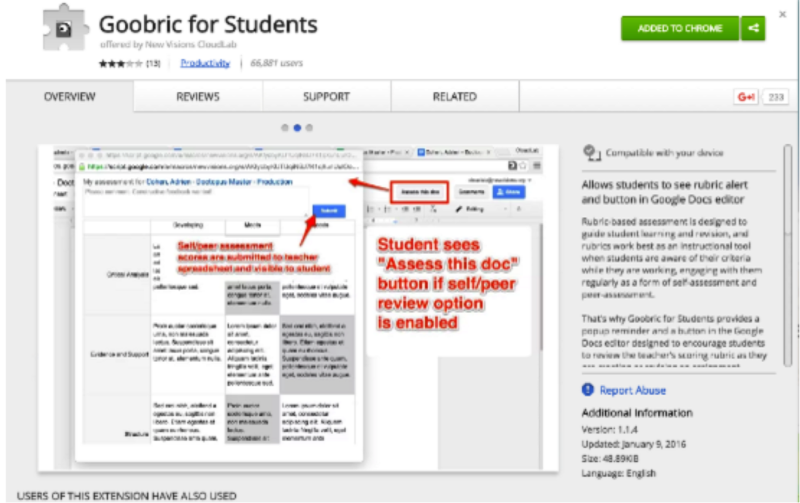 Goobrics for Students: Allows students to use a rubric to assess peers’ documents. Google Forms: Enables students to self-assess their work and their peers’ work using an online survey. This is awesome and timely. Because the process is so engaging, students will be empowered with knowledge and confidence about understanding the process from beginning to end. This is a great combination of evaluation and performance management utilizing contemporary tech tools. Google makes their tool user friendly, so anyone could be a participant with little to no intimidation about technology. Good facilitators make this really work. Who better than the creator of empowerment evaluation to do this…he’s the best. I am looking forward to learning more. This is awesome and timely. It took a bit of work getting up-to-speed on some of the software but once we got it going we did our best to make it transparent to the user and it worked. Because the process is so engaging, students will be empowered with knowledge and confidence about understanding the process from beginning to end. DF: Yes – we explained that the software is free and that we wanted them to help others in the community use it if they needed it. Concerning the concepts, it helped demonstrate the value of self-evaluation, peer assessment, and instructor assessment to refine their work and our teaching (it let us know where we did not communicate as effectively as we should have – but in time to rectify it and improve our instruction). This is a great combination of evaluation and performance management utilizing contemporary tech tools. Google makes their tool user friendly, so anyone could be a participant with little to no intimidation about technology. DF: Yes – Google Forms was particularly useful and easy to use. Good facilitators make this really work. Who better than the creator of empowerment evaluation to do this…he’s the best. DF: You are most kind. We try to model so the can have the same positive attitude toward success and to help folks when things don’t go so well. DF Wonderful. We will have our eStudy webinar this Thursday and the following Thursday. We will be able to go into much more detail during these sessions. You are welcome to join us. Many thanks for your thoughtful comments.